Ok, I'm a Truebie. 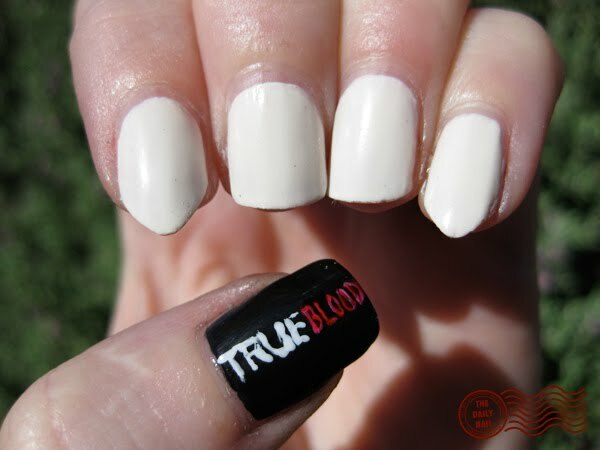 I LOVE True Blood, and have been counting down the days until the Season 3 premiere for months. (since I found out the date) Recently, HBO has been airing little 'commercials' with 2 members of the cast talking about the upcoming season, and it's all I can do to keep from squealing. Seriously. I have had this manicure planned forever, and was so excited to do it today!!! (even though I'm certain I'm going to poke an eye out) I suppose that this manicure would also be appropriate (if you change the thumb) for the upcoming release of Twilight: Eclipse if you aren't a True Blood fan, but honestly, how can you NOT be a True Blood fan... two words... Alexander Skarsgård. Yeah, that sums it up. *drool* Anyway. 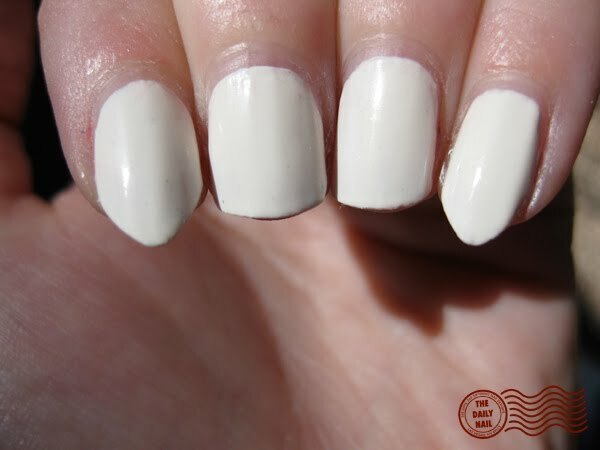 I used American Apparel Cotton as a base for the tooth nails, and for the thumb, I used American Apparel Hassid. For the Blood on the fangs, I used A Beautiful Life Poison, and for the True Blood logo, I used Sally Hansen Professional Lavender Cloud for the logo, then topped the word 'blood' with China Glaze Salsa. Topped everything off with 2 coats of Seche Vite top coat. LOVE TRUE BLOOD! Cute idea! This is the most fun idea ever! It looks like you had a ton of fun doing this! an avid reader of the books but sadly without HBO!! I love the show and I love your nails! These are incredible!! Ok, Eric, Sam, Jason and sometimes Bill - are all easy on the eyes.. Just sayin'! Premiere is about and hour and 20 mins away.. So excited!! OMG how cool is that?! LOVE it!! We're a season behind on TB, so we won't be watching the new season tonight. the fangs are waaaay clever! I love True Boold, this series is great! OMG Bill is so beautiful! Shame that as I'm from Brazil I'll just see tomorrow (I download from the internet) because I will not be able to wait until the 27's when they debut officially here! I loved your nails, I even thought about doing well, but I do nails with drawing of Brazil because Tuesday is the opener! THIS IS A FRIGGIN' SWEETTTT MANICURE. Howww did you get the Beautiful Life Poisin Polish all drippy looking, I bet it took forever to dry? I LOVEE how you did your nails so they look like fangs, that was very creative! And I haven't seen TrueBlood before since I don't have cable, but vampires are crazy awesome, and I like Twilight, So I will have to check out TrueBlood on like Hulu or something. OMg im a trubie and they so cool wish my polish skills were as great as your, but there not so i just tune into the tv and get a bite of true blood. its gay in aus and cant download the new eps HELP ME! OH YEAHHHHHH! I'm a proud Trubie!! I'm obsessed with the show, SO glad it's finally back!!! UGHHH I swear I am the only person on the planet without HBO :( :( :( this is beautiful!! Hehe those a pretty cool nails, took me a while to realise those were teeth though... But what about people who don't like true blood and hate twilight? dude, what the hell did you do to your nails?! the nail art is great!But,what did you do to them? ps, i never whatched true blood. That is a great tribute to a great show! 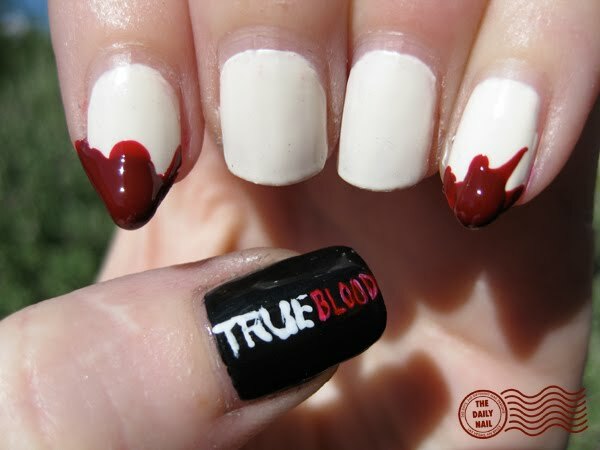 Love the nails and I <3 TrueBlood too! Last night was awesome. LOVE, LOVE the fangs, I'm a Truebie too! I don't have HBO but I'm still a huge fan! These nails are great! love Love LOVE this manicure!!! *sighs* Alexander is HOT!! This season's going to be good! Twilight by day and True Blood by night! LOVE LOVE LOVE this mani!!! :) I'm a huge vampire fan in general- Twilight, Buffy/Angel and True Blood being my favorites (as drastically different as they are). I'm not one for nail art usually - mostly b/c I have zero skill :) but I am SO gonna try to do the fangs!!! :) Thanks so much for sharing your beyond-supernatural talent with us. Team Eric or Team Bill??? Team Eric :D Love, love, love this design!!! This has to be THE most amusing nail design I've seen in a long time. Hooray True Blood! Eric Northman... I'd let him do bad things to ME! btw, what crazy nut would swap Twilight for True Blood? I mean seriously, Sparkly Vampires? What next? UV werewolves?????? This is awesome! you've got good nails and a very good hands of art. I guess this is one way how we can express ourselves too. Are you a painter or an artist? Because you can easily convert your nails into a canvass though. Thanks for posting.